It's time for another LitFuse Blog Tour! 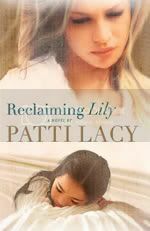 This one, for Reclaiming Lily, an amazing book by Patti Lacy. I reviewed another book by Patti Lacy back at the beginning of the year. Rhythm of Secrets was fabulous, and one thing I said about it then made it so I simply had to request Reclaiming Lily for review: "What I liked more than anything is that Lacy writes most of her significant characters in a way that makes me feel like I can see their point of view, and understand why they are doing what they do." A storm the size of Texas brews when Gloria Powell and Kai Chang meet in a Ft. Worth hotel. They have come to discuss the future of Lily, the daughter Gloria adopted from China and the sister Kai hopes to reclaim. Kai is a doctor who had to give up her little sister during the Cultural Revolution and has since discovered that an inherited genetic defect may be waiting to fatally strike Lily. Gloria's relationship with her daughter is tattered and strained, and the arrival of Kai, despite the woman's apparent good intentions, makes Gloria fearful. Gloria longs to restore her relationship with Lily, but in the wake of this potentially devastating diagnosis, is Kai an answer to prayer--or will her arrival force Gloria to sacrifice more than she ever imagined. The story opens in China, in 1990, when Reverend and Mrs. Powell are there to adopt a baby. Instead, they return home with a beautiful 10-year-old girl who they name Joy. Chapter one picks up in 1997 in that Ft. Worth hotel described above. The story flips back and forth from the point of view of Gloria Powell, Joy's mom, to the point of view of Kai Chang, Lily's older sister. These two women are the most developed characters in the book, but Joy/Lily ends up pretty fleshed out too. I really feel like I know all three of these ladies. You can see what others had to say by visiting the Reclaiming Lily blog tour page. Thanks for spending hours we me and my ladies:) Wow. I'm just thrilled that you connected not once, but twice. I appreciate all you do for authors AND moms. It was a pleasure to spend time with you and your ladies, and while I am cutting back on book reviews, YOU are someone I will keep requesting.